Most people’s feet point straight ahead or slightly outward. Some people’s feet, however, point inward a musculoskeletal condition referred to as in-toeing. 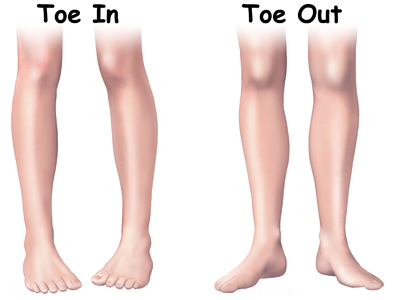 In-toeing affects infants and children and is characterized by an inwardly rotated foot or feet, or, less often, an outwardly rotated foot or feet (sometimes called out-toeing ). Doctors may also refer to this as a rotational problem’ of the lower extremity, which can arise from abnormalities in the growth or alignment of the upper legs, lower legs, or feet. The vast majority of such problems, however, represent simply a physiological variation during a normal stage of development. As a result, a child may be pigeon-toed,’ or, alternatively, one or both feet appear splayed outwards. Depending on the specific cause of the condition, in-toeing may appear at different ages, from birth to adolescence. There are three common causes of in-toeing: (1) medial femoral torsion (also called femoral anteversion ), in which the femur, or thighbone, is rotated inward; (2) medial tibial torsion (also called internal tibial torsion ), which is marked by an inwardly rotated tibia or shinbone in the lower leg; and (3) metatarsus adductus, in which the foot is bent inward like a kidney bean. Out-toeing is much less common than in-toeing, but is caused by similar problems. Generally, children with in-toeing are otherwise completely healthy and do not suffer from other congenital abnormalities or diseases. In-toeing does not cause arthritis or clumsiness. In-toeing is significantly more common than out-toeing and occurs in about 2 out of every 1000 children. Rotational problems are much more common in infants and young children than in adolescents. Metatarsus adductus , another frequent cause of in-toeing, is the most common congenital foot deformity. The upper portion of the leg consists of a single bone called the femur , or thighbone. The top of the femur inserts into the pelvis to form the hip joint, which is a ball-and-socket joint. The bottom of the femur connects to the lower portion of the leg at the knee joint, which is a hinge joint. The lower leg consists of two bones, the tibia and the fibula . The tibia is the shin bone, which is the larger of the two bones, bears most of the weight placed on the lower leg, and is located to the inside of the fibula. The other leg bone is the fibula , which is a thinner bone located to the outside of the tibia and runs parallel to it. The foot has a complex musculoskeletal structure, consisting of 7 bones in the base of the foot, known as tarsal bones , 5 bones in the middle portion of the foot, called metatarsal bones , and a series of 14 small bones, or phalanges , which comprise the toes. The bones are attached to each other and to the lower leg bones by an integrated meshwork of thick, fibrous structures known as ligaments . The areas in which two bones make contact with each other are lined with smooth cartilage coated with a natural lubricating material known as synovial fluid , allowing them to slide past each other with minimal friction. These areas are the joints , and there are many joints in the foot, which collectively allow for movement in the foot and ankle. When a fetus is developing in the womb, the lower limbs initially point outward, then begin rotating inward around the seventh week. However, this rotation causes the toes to point towards each other. During the rest of fetal development, the legs gradually rotate laterally again. This lateral rotational growth continues slightly during childhood, but by the time of birth, the feet are approximately pointed straight forward. A small amount of rotation in infant legs is considered within the range of normal growth variation and is referred to as version. An abnormal amount of rotation is termed torsion . Metatarsus Adductus : Metatarsus adductus is an inward curve of the forefoot. The hindfoot, or heel, is normal. It is usually caused before the baby is born due to the way the baby was packed inside the uterus or womb. Generally, the curve is very flexible and the foot can be straightened by gently pushing it in the opposite direction. In 90% of infants, this bend will resolve on its own. If, after 3-4 months, the curve persists, the foot may benefit from gentle stretching exercises in order to straighten it. If the foot is more rigid, casting is sometimes performed. The goal of treatment is to have a foot that will fit comfortably in a shoe. A little residual inward bending will not cause pain or functional problems. Surgery is very rarely necessary. Internal Tibial Torsion : Internal tibial torsion is a twist in the tibia or the large bone in the lower leg. It is typically first noticed by parents when their child begins walking. It usually affects both legs equally. Most infants have some internal twist of the tibia that disappears by one year of age. If it persists, it is called internal tibial torsion. The cause is unknown but is believed to be related to the way the baby was positioned inside the uterus. In some cases, it may run in families. Typically, the child will stand or walk with the knees pointing forwards, but the feet turning in. In the past, tibial torsion was treated with boots connected by bars that held the feet turned outward. Many children have been treated this way and most of them have developed perfectly straight legs. The problem is that many children who were not treated with the boots and bars also developed straight legs. It turns out that most children correct their twist on their own without any treatment at all. In very rare instances, the child may still have internal tibial torsion as a young adolescent. If this becomes a cosmetic problem for the patient, the bone may be cut and rotated outward to improve the appearance. Internal tibial torsion does not lead to arthritis. Increased Femoral Anterversion : Increased femoral anteversion is an inward twisting of the thigh bone or femur. Many children are born with a small twist of their femur, however this generally improves within the first few years of life. If it persists, the condition is called increased femoral anteversion. Typically, a 3-8 year old child is brought to the physician because the parents have noted in-toeing. The child will stand with the kneecaps and toes pointing inward. It is diagnosed by measuring and comparing the degree of inward and outward rotation of the child’s hips. Recent studies examining many children over time have confirmed that femoral anterversion corrects on its own. Special braces, shoes, and exercises are not needed. Even when it does not resolve completely, it does not cause any functional problems. Very rarely, an adolescent will be unhappy with the appearance of their legs. In this uncommon circumstance, an operation may be necessary to correct the rotation. As described above, in-toeing or out-toeing may begin to manifest itself at different ages, depending on the underlying musculoskeletal cause of the condition. When a rotational problem of the lower extremities is suspected, a complete physical examination will be performed to evaluate the severity of the condition and its cause, and to ensure that no other deformities or orthopaedic conditions are present. An assessment known as the rotational profile (also called the torsional profile ) will also be performed, which involves taking six different measurements of the angles of the feet, legs, and hips when the child is in various positions and when walking or running. This allows for detection of isolated abnormal angles and facilitates identification of the cause of the rotational problem. X-rays of the legs and feet will also be taken to assist with definitive diagnosis and treatment planning. More sophisticated radiographic imaging techniques, such as a CT (computed tomography) scan and MRI (magnetic resonance imaging), are sometimes performed as well. Rotational problems are common in infants and children. However, the majority of deformities are minor, will not cause functional deficiencies, and will resolve on their own. Operative treatment is rarely necessary. Children with in-toeing or out-toeing go on to have no limitations in their activities, from simple outdoor games to competitive sports. Therefore, although rotational problems may present some early challenges for children and parents alike, parents can expect their child to live a normal, active, and healthy life. Naturally, you may have other questions about in-toeing or out-toeing that are not answered in the above summary. As your orthopaedic surgeon, we welcome any and all questions you may have, which we urge you to pose during your next office visit. Do give us a call at +65 9724 1219 or email us at feedback2@bone.com.sg if you have any further queries.